What happened to all the profits? In the past three years, the dollar has risen over 10% against a basket of major currencies (see graph below). That's good on the margin, but the fact remains that the dollar is still quite weak from a long-term historical perspective. To put it another way, rather than saying that the dollar is strong on the margin, it's more accurate to say it's "less weak." However you put it, though, the dollar is confirming that the Fed is on the right track and the U.S. economy is doing better on the margin than most other countries, even though this remains the weakest recovery ever. This chart compares the dollar to a trade-weighted average of the Euro, Yen, Pound, Canadian Dollar, Swedish Krona, and Swiss Franc. Here we see that the dollar today is worth a bit more than its average of the past five years or so. Mid-2011 saw the all-time low in the dollar, both in real and nominal terms. 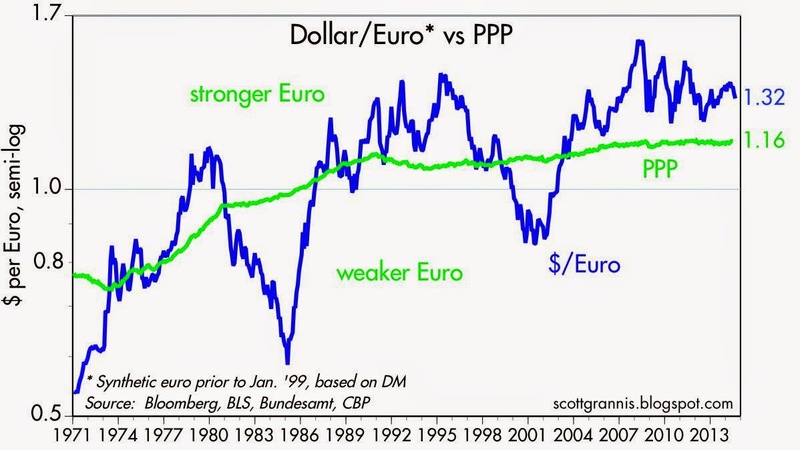 The chart above compares the inflation-adjusted value of the dollar against a very large (broad) basket of currencies and against all major currencies. This is arguably the best measure of the dollar's strength or weakness. Relative to its all-time low, the dollar is up 8-14%. Relative to its long-term average, the dollar is down about 10% or so. 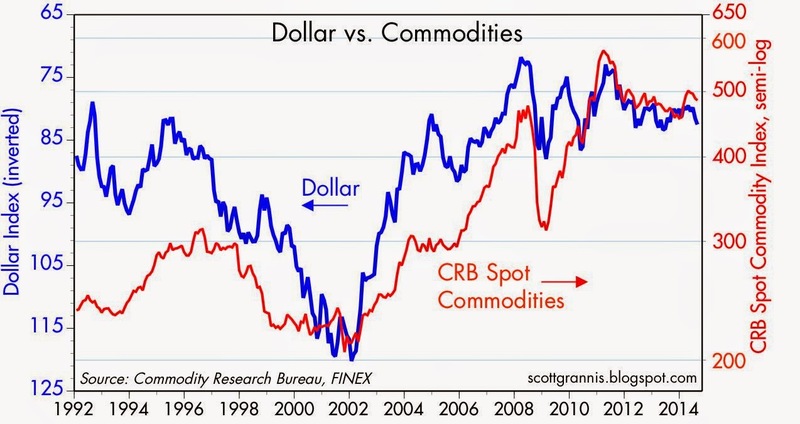 The fact the dollar is still weak helps explain why commodity prices are still relatively strong, as the graph above suggests. 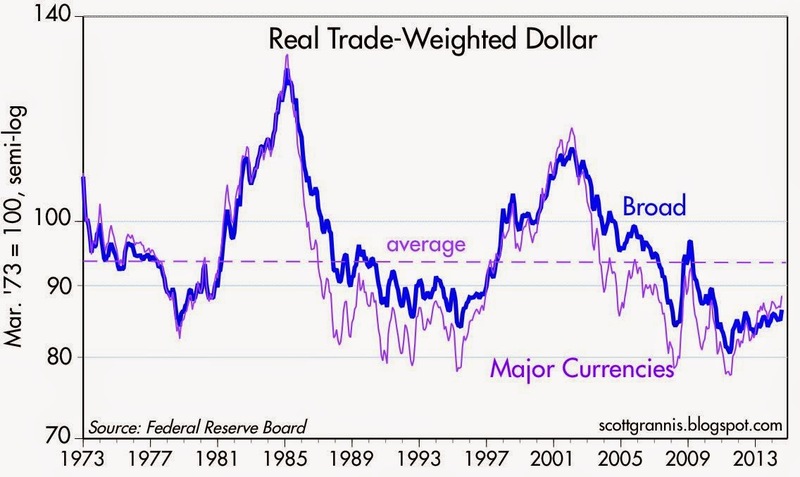 (Note the inverted axis for the dollar's value: the dollar's big decline from 2002 coincided with the big rise in commodity prices over the same period. The two tend to move inversely.) If the dollar continues to improve, however, I suspect that will be bad news for commodity prices. Gold too should suffer from a stronger dollar, since it has tended to track commodity prices directly. 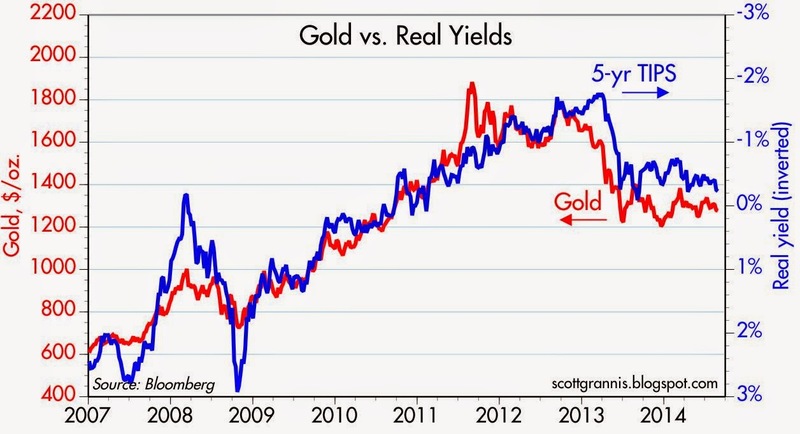 As the graph above shows, gold prices and TIPS yields have tended to move inversely for a number of years. 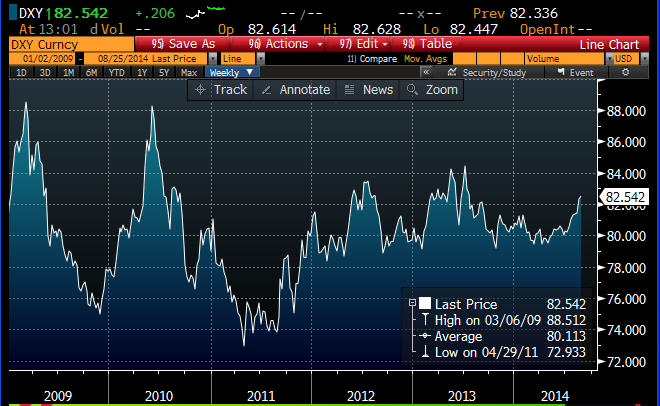 Since bond yields and bond prices move inversely, the blue line is a proxy for the price of TIPS. 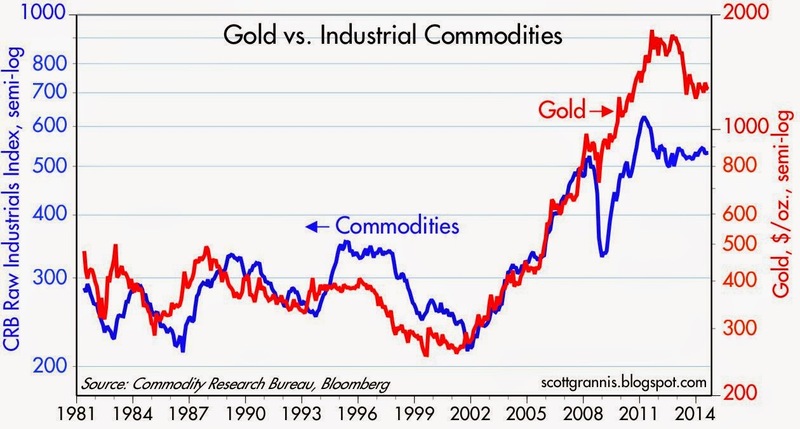 What this chart shows is that the price of gold and the price of inflation-adjusted bonds have moved together, and both are down significantly from their highs of a few years ago. Higher interest rates going forward—especially real interest rates—are thus likely to coincide with a stronger dollar, weaker commodity and gold prices, and a stronger economy. The graph above (and the two that follow) show my calculation of the dollar's Purchasing Power Parity (i.e., the value of the dollar that would make prices in the U.S. approximately equal to prices in other countries) against other major currencies. 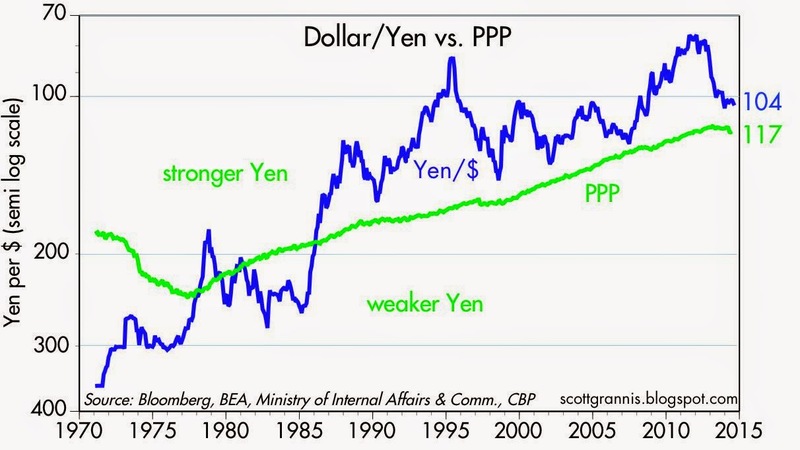 The principle source of the dollar's gains in recent years has been the weakness of the Japanese yen. The yen is now much less overvalued vis a vis the dollar than it was a few years ago, thanks to the BoJ's aggressive easing measures. Japanese inflation has risen from negative territory last year to 3.6% in the 12 months ended June 2014. 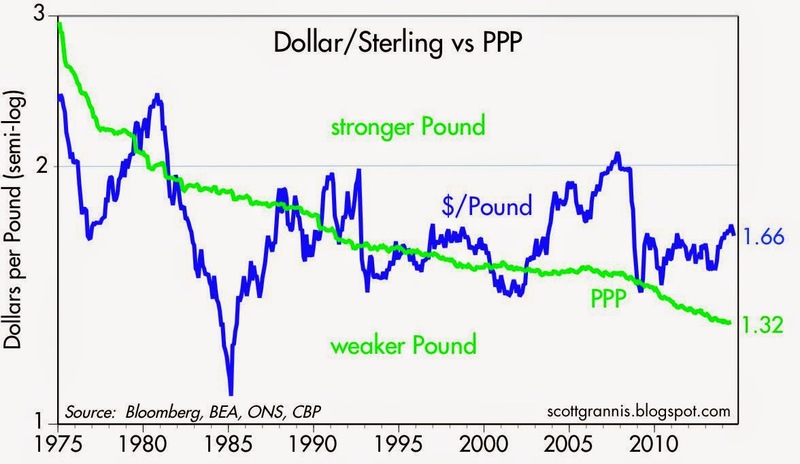 The pound remains substantially overvalued vis a vis the dollar, despite the fact that U.K. inflation in recent years has outpaced U.S. inflation. The Euro has weakened a bit in recent months as it has become obvious that the Eurozone economy is still quite weak compared to the U.S. economy, and the ECB is gearing up to take more aggressive QE measures. But it is still somewhat overvalued vis a vis the dollar according to my calculations.